Difficult if you've seen Borat (2006) not to draw obvious comparisons, despite "Burn Country" being a human drama, profound yet also somewhat entertaining. 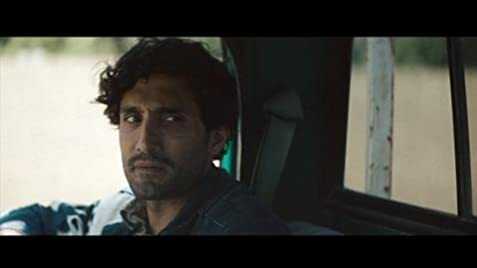 The character, Osman, (played by Dominic Rains) has arrived fresh from Afghanistan into small-town California, a romantic terrain of rolling mists, deserted beaches, Sequoia trees and American homesteads inhabited, it seems exclusively by white rednecks and new-age hippies. The refugee-Afghan interpreter, journalist and "fixer" intent on using journalism in his new life sports a mustache and stubble, together with more than a touch of that endearing, unpredictable, quirky nature that got Sacha Baron-Cohen's "Borat" in such trouble with his critics. The obvious nature of Osman's recent violent war- torn past, however that led him to seek asylum on the US is reflected in events that unfold during the not-so-innocent Afghan journalist's familiarization with American backwoods life – inhabited by a community whose tribal "answers" to the problems of their often violent way of living sometimes rivals even Osman's birthplace, continents away, supposedly proving that we are, under the skin not so different from one another.
. like you had to get out to have a chance of really living.."
Since the justification for the journalist's asylum in America is never in doubt (with him unable to return home), the depiction of small- town America here ought make Americans feel rightly proud for welcoming a stranger so unconditionally into their close-knit tribe. Burn Country does, in a sense accentuate the need for community over city, notwithstanding its incredibly "fuzzy" attitude towards the dispensing law and order - the positive message from this movie being the power of Human Nature to eventually triumph over personal differences and other adversities.